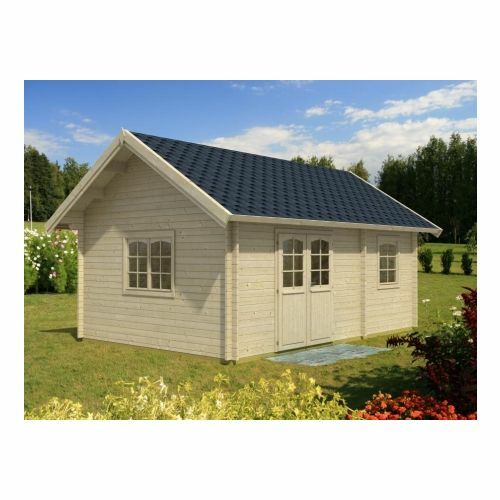 The Utah 3 is a fantastic single tongue and grooved building made from panels. This pent roof building has misted glazing and low door sill covered with stainless steel. With an internal floor space of 12.7m2, this building would make for a great summerhouse or summertime reading room. This model has two rooms, one that could be a great storage room. 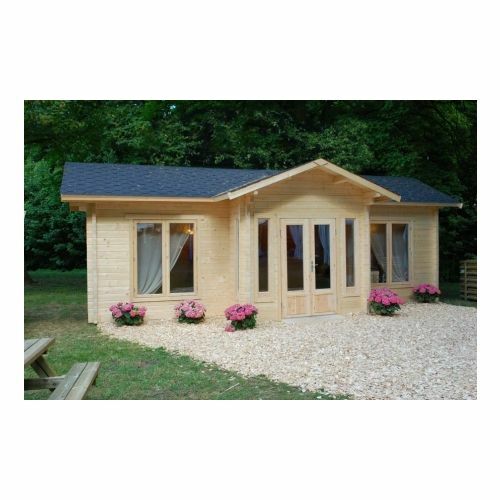 The Orlando Log Cabin is a great design of a log cabin, with multiple rooms and even a loft space with joining steps. 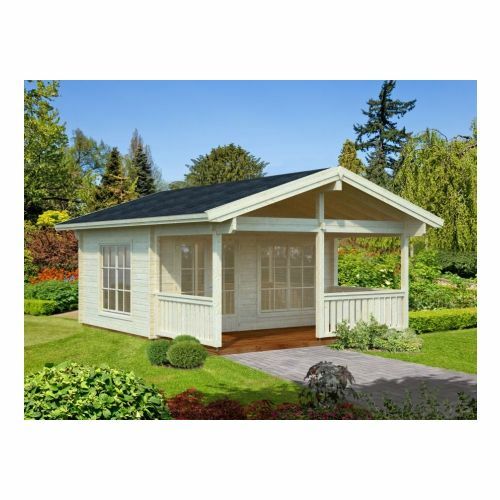 The main room of this building measures out at just over 3.5m wide, meaning that it can easily be used as a garden office and more, the two smaller rooms however are mainly used for sleeping and storage needs by customers. This Log Cabin has many different surprises, with the space inside actually surprising itself, this cottage-type of building when insulated is unlike many other holiday homes and larger buildings as the warmth struggles to escape through the large roof. Our Arkansas 1 has to be the summer house of your dreams. Where to begin with its many features and attractions? Bright, light and probably the perfect garden summer room or detached home extension for your garden. 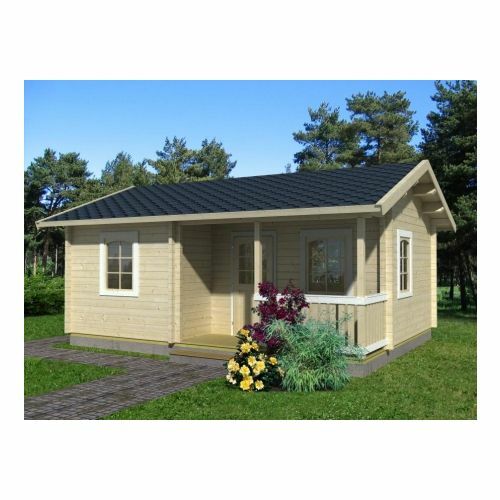 Introducing this multi-room Log Cabin Cottage with a sheltered veranda area, the Wyoming. 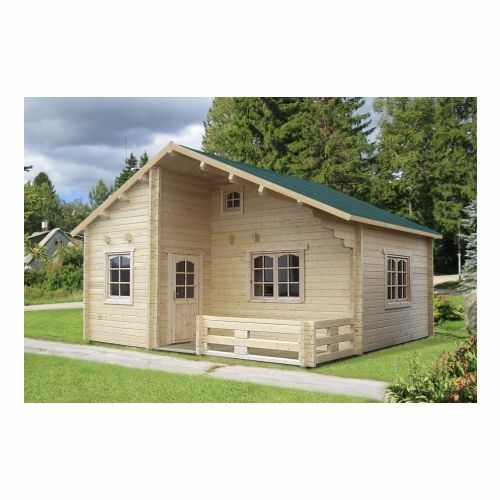 The Wyoming Log Cabin is a large building with 3 spacious rooms, as you will see by the floor plan below these are commonly used as living areas, bedrooms and even bathrooms in some cases. 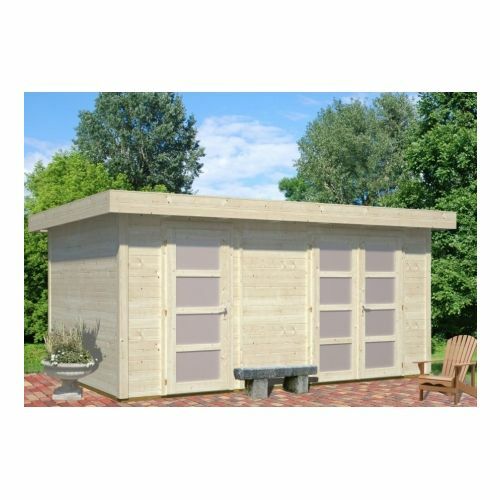 With 70mm thick logs this building is a premium model for those looking for a long-lasting building for use as extra space outside of their house, a garden office or a large workshop. Sometimes people refer to timber buildings as 'sheds', but this is hardly the word to describe a holiday summer house as study and substantial as the Wyoming. In fact, it's more like a cottage or house. 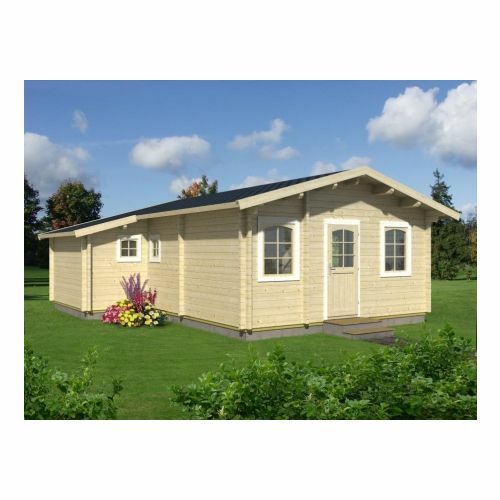 It's certainly big and solid enough to use for guest accommodation or a large garden office. 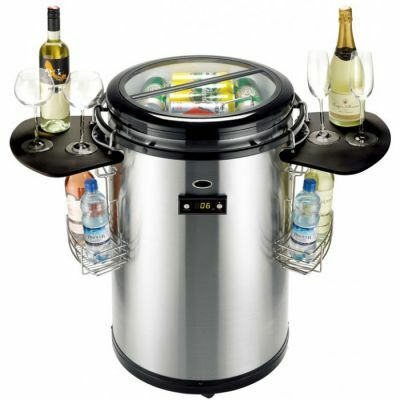 It's a good alternative to a caravan or static home. Who needs an overseas holiday when you could spend the summer in the Alaska log cabin summer house? 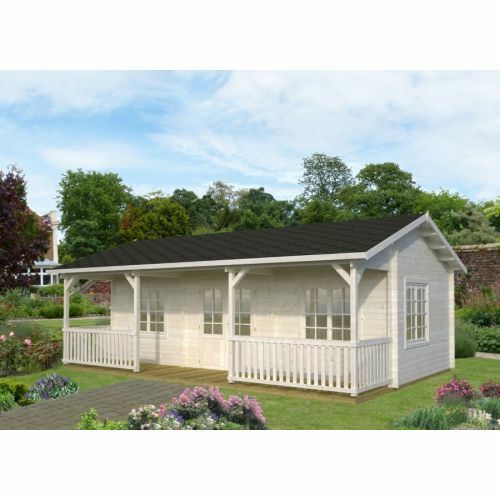 With three rooms, decking and space for a toilet and washroom, it could serve very well as a holiday cabin, sports pavilion or a community social room. The design features of the Manhattan log cabin holiday chalet are akin to the log cabin designs that frequent the French Alps, and the close-grained 70mm logs used for the walls would be adequate for Alpine weather conditions too. 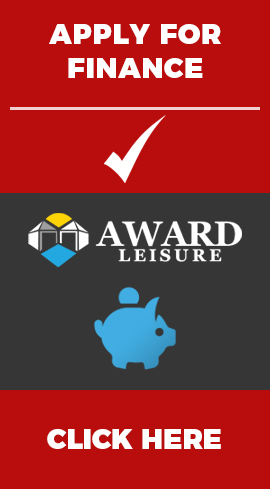 Their dense grain maximises their insulation properties, and creates a durable, robust build. 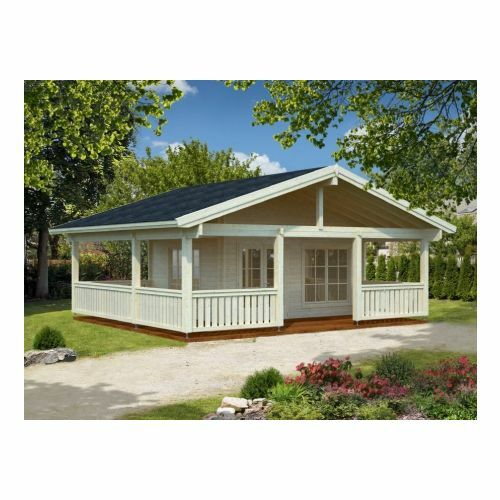 Arkansas 2 has to be the summer house of your dreams, whether you choose this Arkansas or the Arkansas 1 with the smaller veranda. Where to begin with its many features and attractions? 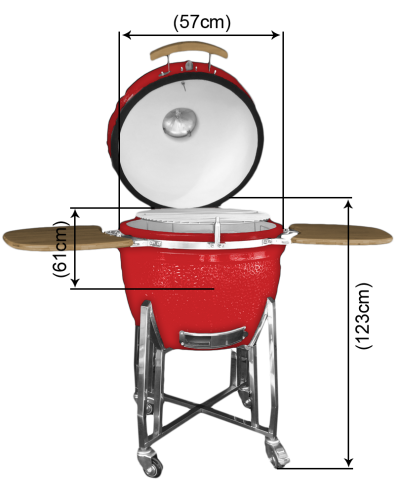 Let's start with the basics: the build. 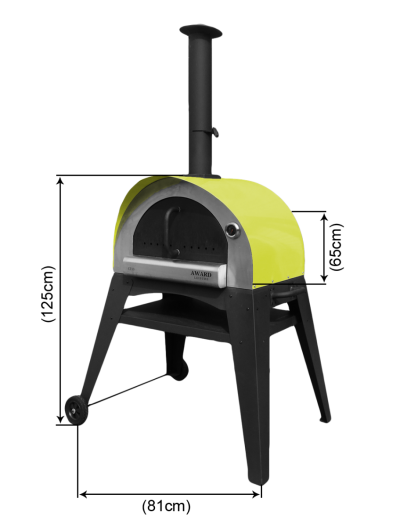 It's constructed from thick, durable 70mm timber. This means that the "summer" house is designed for year-round usage, from a New Year's Eve feast to camping out in spring or summer to running a business. The Texas 2 timber holiday home is a multifunctional building that could be used as either a holiday retreat in the countryside or a professional workspace for a new business. With three sizeable rooms, and even a storage cupboard, the Nevada timber holiday house is not your average garden log cabin. Indeed, with 39 square meters of floor space, it may be bigger than many people's garden.